I intend to do at least one FNY post every day this month, which I don’t think I’ve done for a couple of years. My task has been made easier by scanning in a few dozen photos taken on 35MM film between 1998 and 2001 when I used film for the site and also for my book on HarperCollins of the same name. This is the Queens end of the Welfare Island Bridge (now Roosevelt Island Bridge) spanning the east channel of the East River to the island. It remains the only vehicular means of entering the island ever since it was built in 1955. A tram connection was added in 1976, and a subway in 1989. 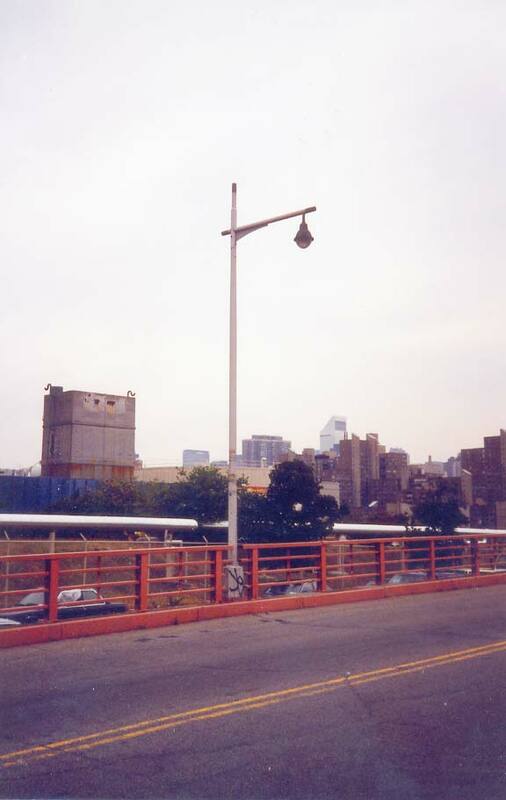 In 1999, there were several “Whitestone” variety lampposts still in place, complete with Westinghouse incandescent lights. These lamps first appeared on the Bronx-Whitestone Bridge in the 1930s and became standard issue posts on expressways and parkways (that weren’t served by Woodie poles, which predated them). 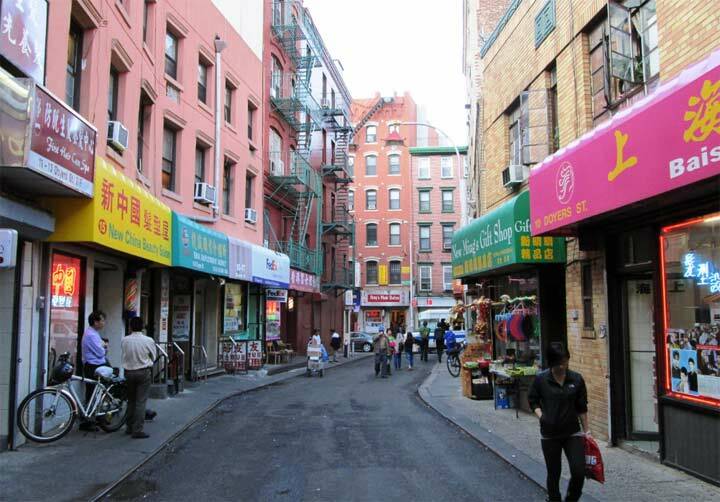 Beginning in the 1960s these posts began to be edged out by Deskeys and cylindrical highway posts, but a few clutches of them still survive, especially on both ends of the Brooklyn Bridge on its approach roads. 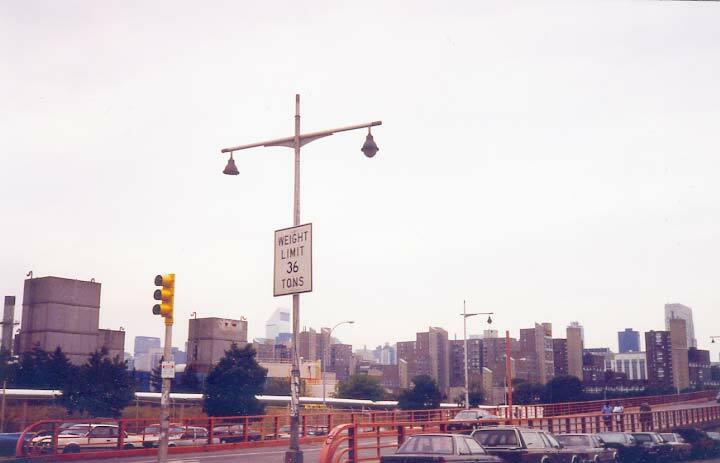 In the mid-200os the Roosevelt Island Bridge got a makeover complete with the same shade maroon paint the Hell Gate Bridge got (which quickly fades into pink in bright sun) and these posts went to the junk heap, instead of a lamppost museum where they would belong. Prior to construction of the Welfare Island Bridge, there was vehicular access via the Queensborough Bridge. There used to be a building just north of the bridge which had an elevator that brought vehicles from that lower level of the bridge down to the island, or up to the bridge roadway from the island. You simply stopped your vehicle in mid-span and waited for the elevator to be available! Inevitably, there were traffic issues. The elevator was rather small, and, by the 1950’s had trouble accommodating contemporary motor vehicles. For example, only older, smaller Fire Trucks could use it. With the opening of the new bridge in 1955, the old elevator building could be dismantled and ferry service could be discontinued. Interestingly, passenger ferry service has been proposed to return in 2017.